Have a look at the orkney.com newsletter. We have had severe gales this weekend with spectacular seas. This photo was taken at Skaill beach this morning, 30th November 2015, which is adjacent to Skara Brae. The real power and strength of the seas can not be captured properly on camera. It really has to be seen to be believed. Malaysian guests review in visitor's book. "After a long day of site seeing, driving back to Kringla apartments feels like coming home. With it's cheerful decor and more amenities than one needs while travelling, our stay in Orkney has truly been wonderful." Last Sunday we took an hour off and went for a walk to the Brough of Birsay. It was beautiful. We witnessed two visitors almost getting stranded on the other side of the tidal causeway. We whistled and shouted to get their attention and they eventually realised we were trying to warn them of the state of the tide. You can cross over 2 hours either side of low tide and the tide seems to rise very slowly until the last 20 mins when it sweeps in at great speed. 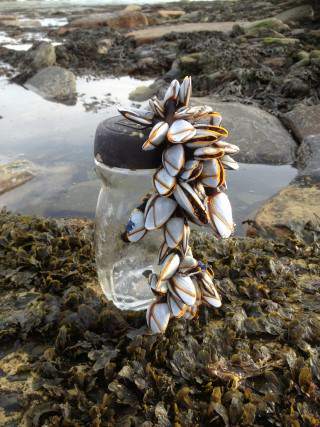 We came across this jar as we were coming back, I wonder how long it had been on the sea bed to allow the shellfish to attach themselves? And how did it then get dislodged and arrive on the shore?